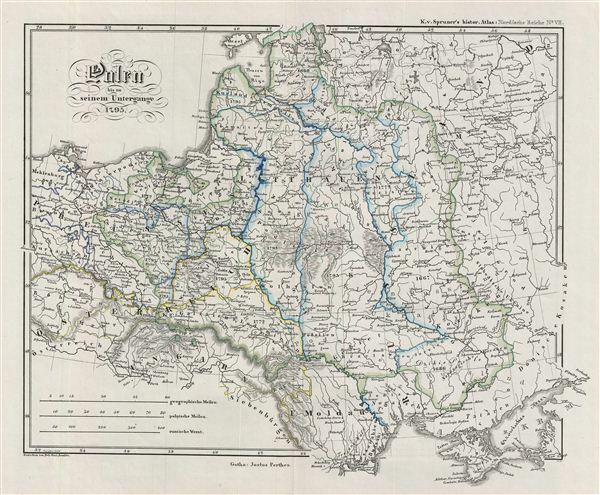 This is Karl von Spruner's 1854 historical map of Poland from the first Partition of Poland in 1772, through the Second and Third Partitions, to the dissolution of the Polish-Lithuanian Commonwealth in 1795. The map coves Poland from Livonia to Moldavia and shows parts of neighboring Russia and Germany. The map details the critical year of 1795, when the Third (and last) Partition of Poland permanently dissolved the Polish-Lithuanian Commonwealth. Following the First and the Second Partitions of Poland, which were influenced by rise of the Russian empire, increasing unrest in the remaining commonwealth provinces led Polish nationalist demands for reunification. The only way to resolve this issue, as seen by the partitioning powers, was to eliminate entirely the independent Polish state. In 1775, in the Third Partition, the remaining territories of the Polish-Lithuanian Commonwealth were divided between Russia, Prussia and Austria. The whole is rendered in finely engraved detail exhibiting throughout the fine craftsmanship of the Perthes firm. Prepared by Karl Spruner for publication as plate N VI in the second edition of Justus Perthes' 1854 Historich-Geographischer, Hand-Atlas zur Geschichte der Staaten europa's vom Anfang des Mittelalters bis auf die Neueste Zeit.